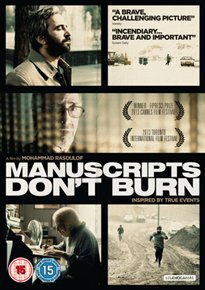 Controversial Iranian film – MANUSCRIPTS DON’T BURN – gets UK dvd release. Daring and politically provocative thriller in which two government officials are on a mission to arrest an author who manages to secretly write down his memoirs, despite being under strict monitoring by the national security service. In 2011 Mohammad Rasoulof was banned from working for 20 years by the Iranian authorities and shot this film in secret. The film was smuggled to Cannes in 2013 in such secrecy that the end credits decline to list the names of any of the film’s cast and crew in order to ensure their safety.